I'll just say it. My desk is far from how I want it to be. Those Pinterest and Tumblr posts of desks have me swooning, but let's just be honest, not everyone is capable of having their desk look like a million bucks. I've been working on trying to glam up my desk lately, which is harder than it looks. 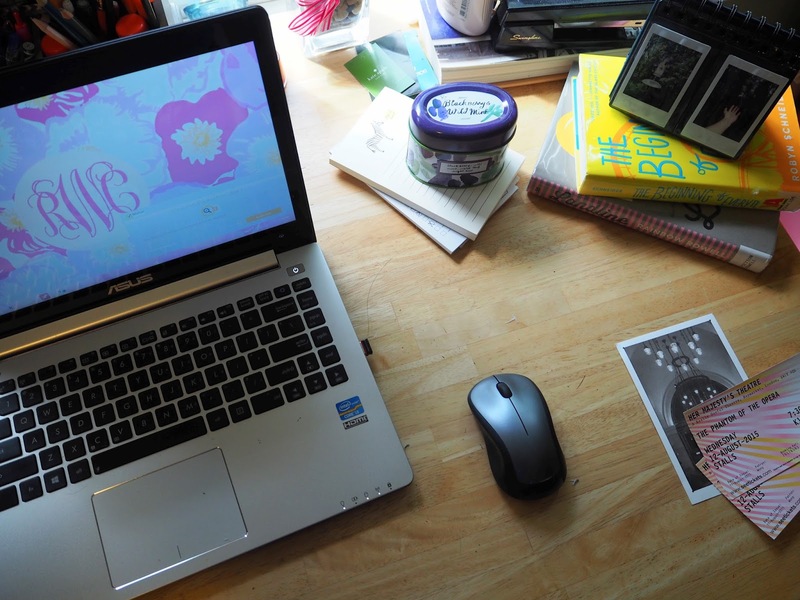 Nevertheless, I've taken a few shots of my desk and picked some things that I am definitely coveting to be on my desk. I can't go through this post by not mentioning my Lilly Pulitzer agenda. I have the medium size, since I really don't need the large agenda, because I only use my agenda for schoolwork and all of my blog organization is separate. I discovered that one of my best friends also bought the exact same agenda, but hey, great minds think alike! I also picked up these recently from Target, these jumbo paper clips and mini binder clips. 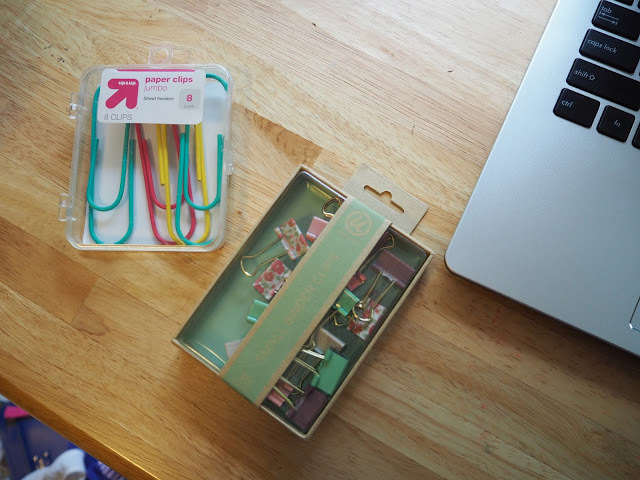 I talked about these jumbo paper clips before on my desk essentials post, but my desk has come a long way from that blog post. In addition, these mini binder clips have been thrown into the fold. There are assorted patterns and colors on them, a fake wooden design, pink ones, mint ones, and floral ones. These are super cute and will hopefully help to keep me organized. Currently, I have a candle on my desk, I'm trying to stop using candles after an incident where I forgot to put out one. Luckily, I didn't burn the house down, but it could have been very bad if I hadn't noticed it. In addition, candles are so expensive and this is going to be one of my methods to save money. However, once in a while I burn a candle, which I love doing while working on the blog or studying. This one is my favorite. It's a blackberry and wild mint candle from Anthropologie. It mostly smells of berries, with of course, a light tint of mint. I picked up this sticky note set from ban.do and I'm absolutely OBSESSED with it. It has 3 sizes of sticky notes that are all adorable. My favorite one it the one on the top left, which has a pink speech bubble saying, "Hey hey hey, you can do this!" Ban.do has the best things and these sticky notes will definitely be adorning all of my school things. 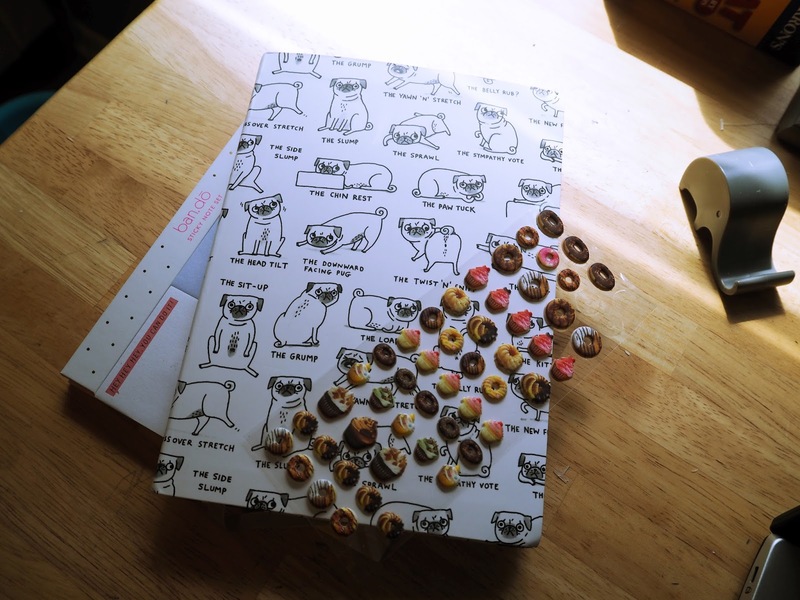 And since we're on the topic of things I'm obsessed with, let's talk about this notebook with cute little pugs on it that I got from ASOS. This notebook has little cartoons of pugs doing all kinds of poses, such as the downward facing pug, the side slump, the head-tilt, and so many more. I've been using this notebook as my personal journal, recently for writing about my travels so that I can remember them all and get them onto my travel diary. Don't know what I'm talking about when I say, "travel diary?" I've been writing about my recent travels daily on the blog, starting with Cologne and ending with London. Keep up or catch up on my travel diaries by clicking here. Also on my desk I have these food stickers that my friend got for me when she went to Japan, with donuts and cupcakes. 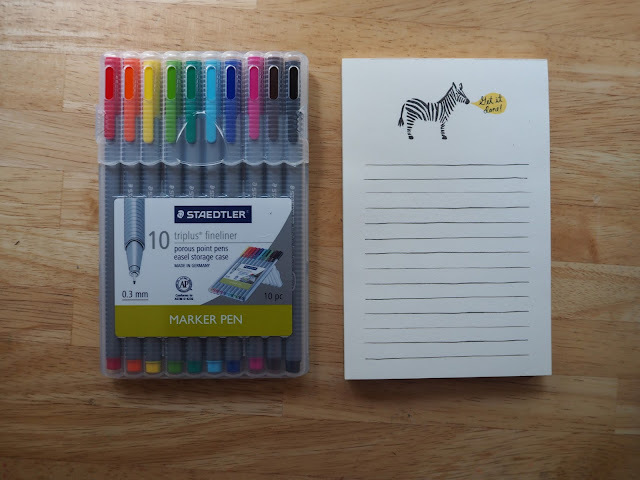 In addition to the stickers is this notepad from Rifle Paper Co., with a zebra and a speech bubble saying, "Get it done!" And of course, I can't live without my colored pens. I'm not exactly sure, but for some reason these Staedtler fine tip pens are really popular at my school, so I found it fitting to pick these up and see what makes these so popular. What I like about these is that the fine tips are actually fine tipped. These create super small little lines, which will be very useful for future stationery making. 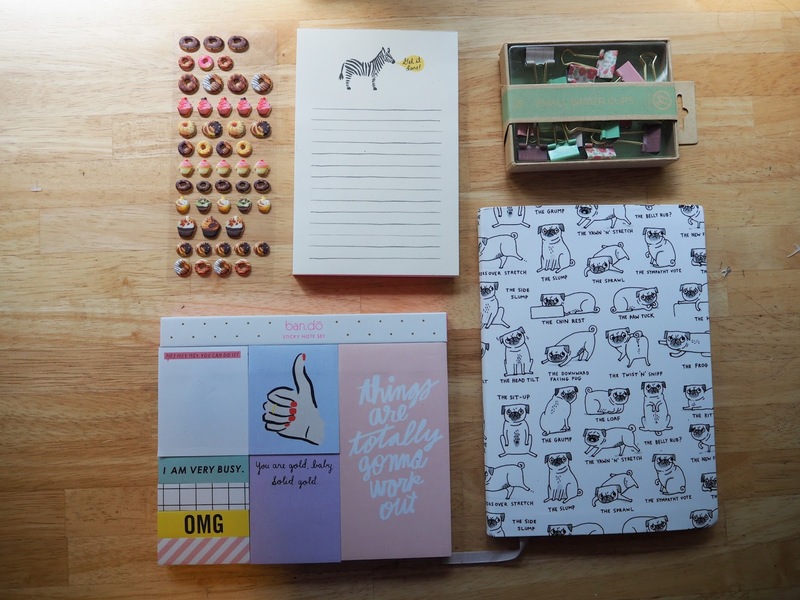 They will also be nice for just doodling in notebooks and color coding my notes. One of my favorite things on my desk-- my laptop. I'm almost attached to my laptop at the hip. I made this desktop background for my laptop with my monogram by using a Lilly print. This picture really doesn't do it justice, I have a much better picture of it on this other blog post about my after school routine. This adds a super nice pop of color to my desk and makes me happy to see when I turn on my laptop. I also have some other random things on my desk (let's just be honest-- who doesn't?) such as some books and a little flip through photo album where I can put the pictures that I've printed from my instant camera, which I purchased at Urban Outfitters. I've recently realized that it's the little things that glams up a desk. Although my desk is located by the window and I can't make an awesome gallery wall, I can still glam it up with small things and little pops of colors. And although my desk isn't nearly pinterest worthy, I like to think that I did pretty decently. If you're looking to glam up your desk, the cute little things can really dress it up, such as stationery and pencil holders. I've added some things that I really like that can create some flair for your desk. 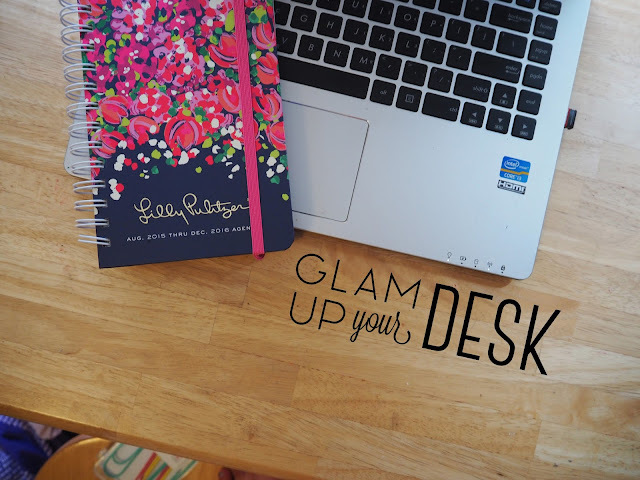 Not looking to spend too much money on stationery to add a little glam to your desk? No worries! My #BloggersBTS post from last week has some free printable stationery that I made with my own two hands. You can visit that post by clicking here. Wishing you (and your desk) the best, as we near closer and closer to back to school season. I've already gone back to school and my desk has the potential to get very messy as the homework arrives. However, you could always use a little more glam. Sidenote: This post is in participation of the #BloggersBTS linkup! Your supplies are so cute! I love the sticky notes and I actually just got the same notepad today. I can't wait to use it! You're going to love the notepad, I definitely do! I have that exact Lilly agenda, except in large, great minds think alike!! All these desk accessories are so cute!!!!! !